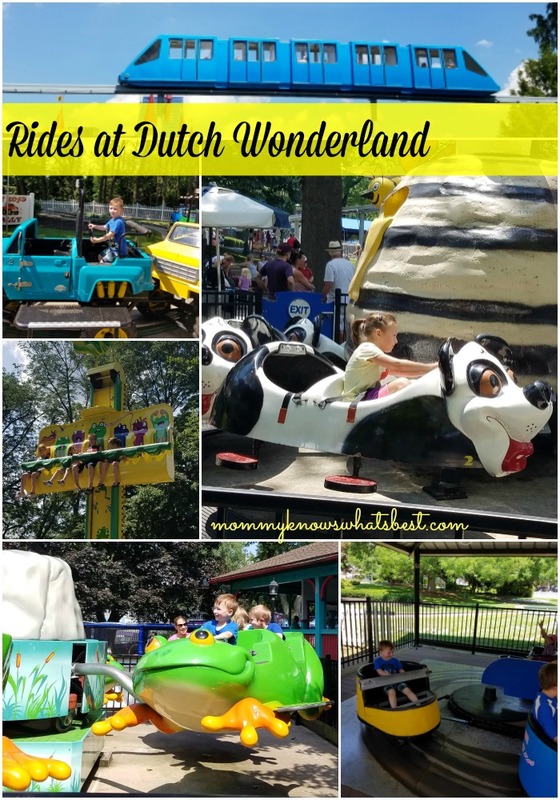 Have you ever heard of Dutch Wonderland, an amusement park for kids? (You should be shouting YES if you are a fan of mine on Facebook!) 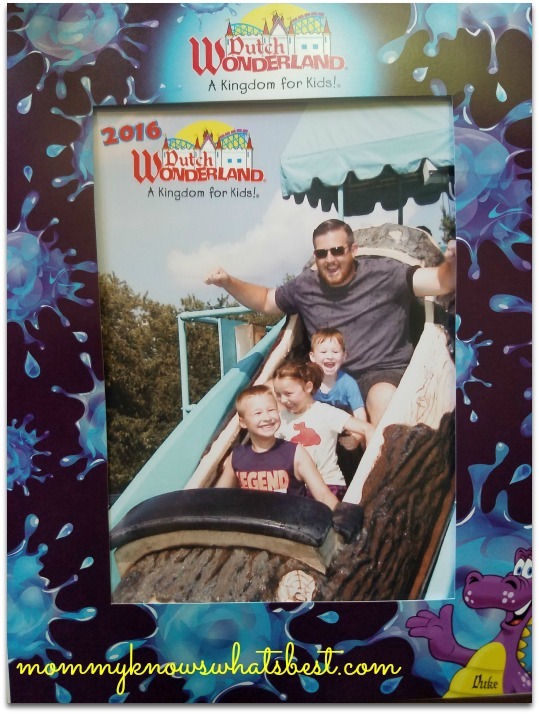 Thanks to Dutch Wonderland, I was once again chosen to visit the park as a blogger ambassador this year! 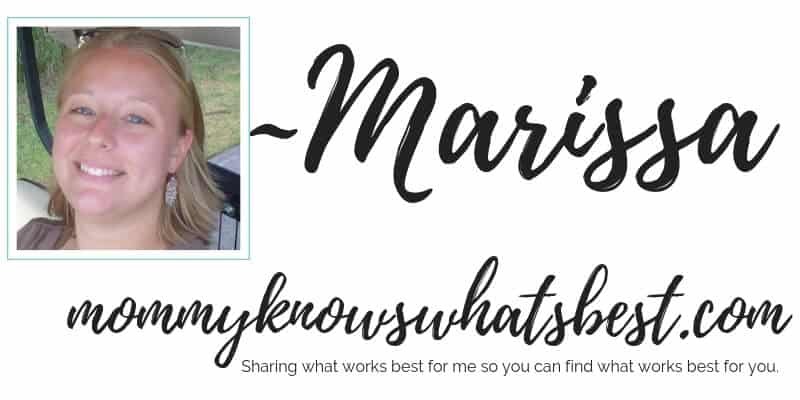 For my readers, they have given me a promo code to share! Click here and use PROMO CODE summerblog19 to get $5 OFF when you order your tickets online. I couldn’t say no when we were invited to visit Dutch Wonderland again. 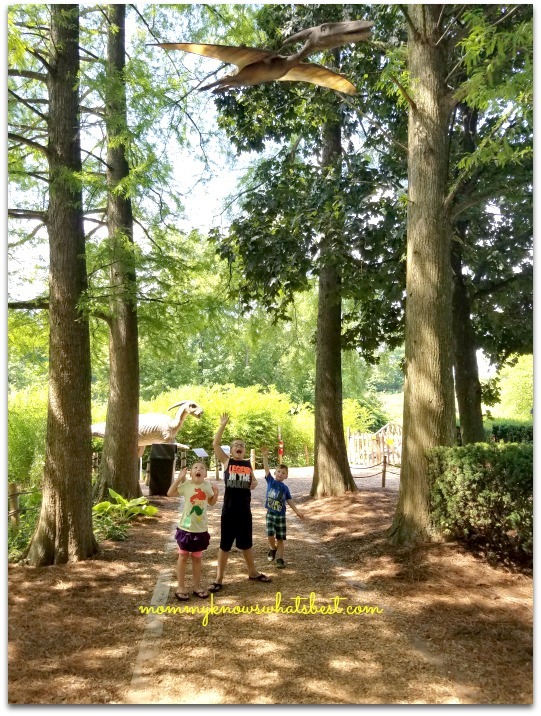 We visit the park back in 2014 when our three oldest kiddos were only 6, 3.5, and 1. They had such a great time! You can read that Dutch Wonderland Review here. Now my kiddos are 8, 5.5, 3, and 6 months. We had a slightly different experience than last time, but only because we were able to try new things now that they’re all older! What Time Does Dutch Wonderland Open? Dutch Wonderland opens at 10 am and closes at 8:30 pm in the summer. There are a variety of times for pre-season and post-season hours, and also different times for holidays or special events. We got there at around 1 pm, a little later than we had planned but you can’t always predict how traffic is going to be in Pennsylvania in the summer. It was fine because we still had plenty of time to experience everything! 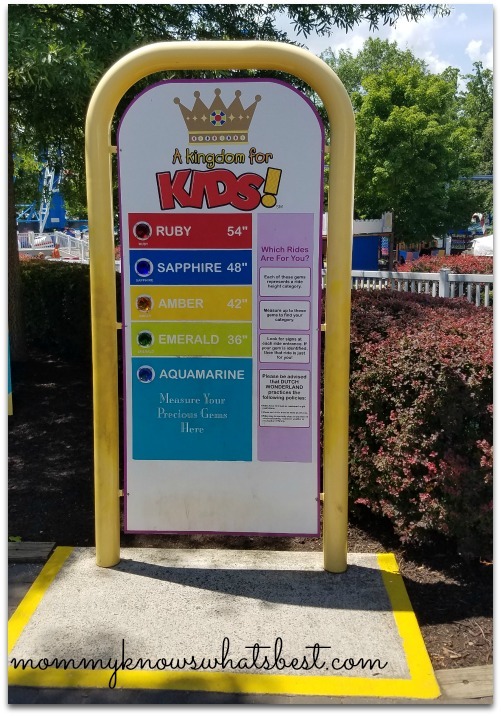 There are three new things at Dutch Wonderland this year! 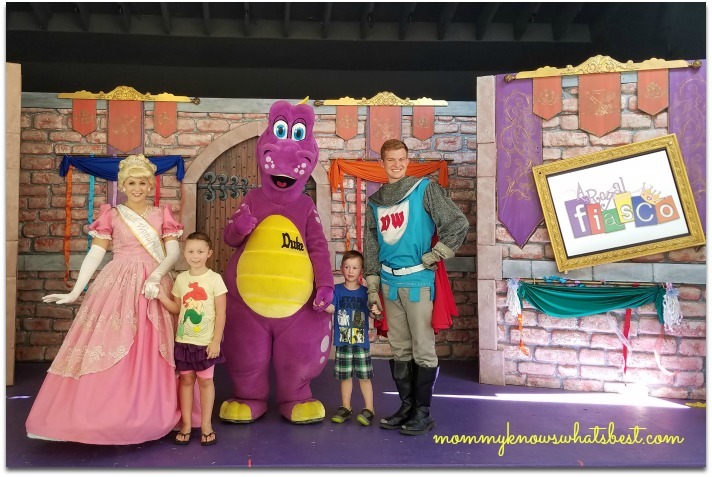 Two new shows opened: Kingdom Celebration starring Princess Brooke and other characters, and A Royal Fiasco, starring two of Princess Brooke’s assistants and the Knight of Safety, Duke the Dragon. We watched A Royal Fiasco and got to take some photos with the cast of characters! 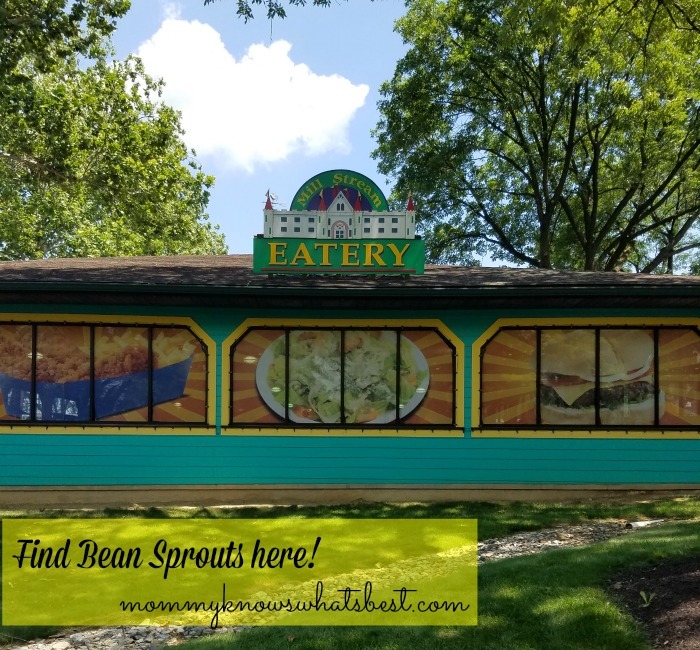 Also new this year is Bean Sprouts, the new meal option in the Mill Stream Eatery. It features healthy food choices for kids and adults. There are 35 kid-friendly, family-friendly rides at Dutch Wonderland. While we didn’t get to go on all of them, I will tell you about the ones we enjoyed this year! Space Shuttle: Great for big kids who want to feel like they’re flying in a space shuttle! Duke’s Dozers: Little diggers with movable parts perfect for kids 5 and under. The ride moves at a slower speed than most park rides, which is great for the little kiddos! Leapin’ Frogs: Up and down and round and round! My 3 year old loved this ride! Frog Hopper: Go up up up, and then bounce back down! Dragon’s Lair: Not as scary as it sounds! Travel around in a little boat and help Duke find his friends hidden in the area! Sky Ride: Travel from one side of the park to another from up above! Panda Party : Another great ride for the little kids. The pandas go up and down just a bit as the ride goes around. Off-Road Rally: Kids ride around in monster truck-like vehicles that move just like larger power wheels. Fun for the bigger kids! Wonder Whip: This was a mini-version of the classic (and one of my favorites) The Whip. Double Splash Flume: This is my husband’s favorite. Not one, but two big splashes on this log flume ride! Gondola Cruise: We traveled around Exploration Island and the surrounding farmland. The kiddos got to see the dinos from a different perspective! Monorail: See the park from the sky! You get to sit in your own little space and see the rides from up above! Pipeline Plunge: This is one of my oldest’s favorite rides. Pick which slide you want to go down on this water slide, located near Duke’s Lagoon. Perfect for when you’re in your bathing suit! Joust Family Coaster: This is a mini-roller coaster, but it’s plenty of fun for the whole family! 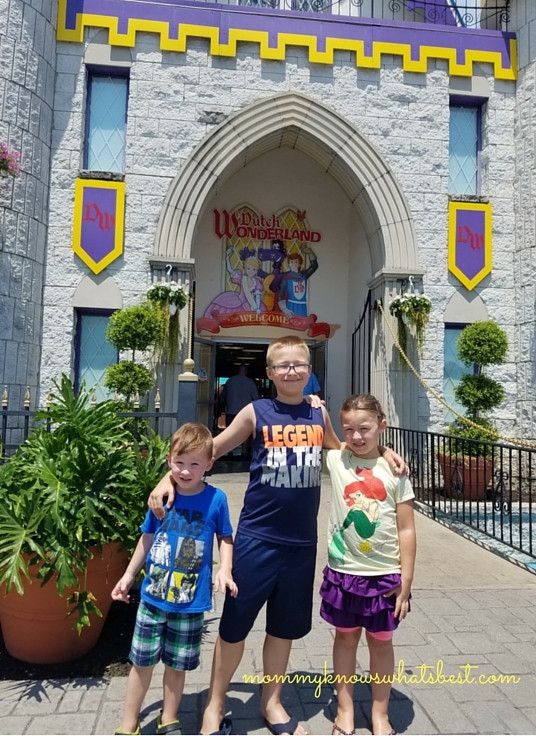 Kingdom Coaster: I kid you not, my two oldest kids went on this about 7 times…in a row! It’s a big-kid version of the Family Coaster, but with a bigger hill and more turns. 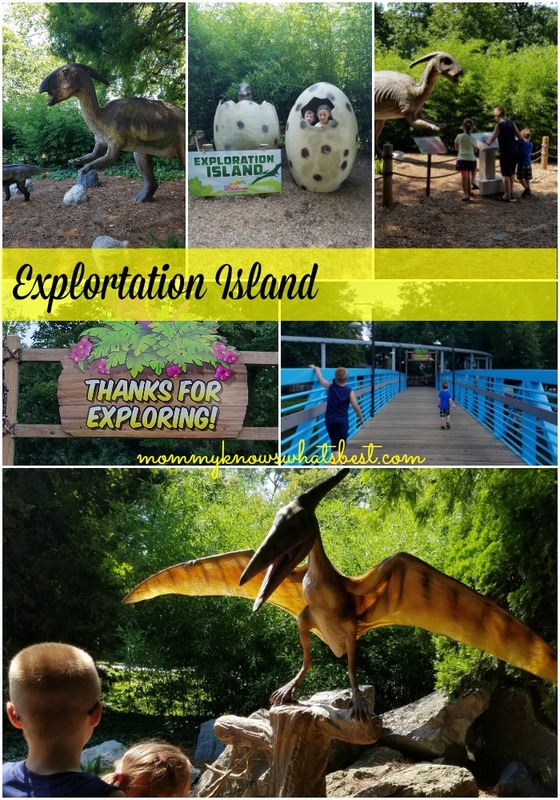 Exploration Island, which was new to the park for 2014, is an island where adventurers can dig for dinosaur bones, walk around moving dinosaurs, ride the iconic Turnpike Ride, and go on the Gondola Cruise. Dino Dig is the first thing you find in Exploration Island. Kids can dig in the sand to find dinosaur fossils and bones. It was a little too hot that day to check it out, but we did enjoy it last time we visited! Next up is Prehistoric Path. There are about a dozen or so animatronic dinosaurs and their families. They make real-life sounds and movements (which, coming from the T-Rex was a tad scary for little kids…but awesome!). There were even dinosaurs overhead! There are two rides within Exploration Island: Turn Pike Ride and Gondola Cruise. We didn’t get a chance to go on the Turn Pike, but the Gondola Cruise gave us a nice tour of the island! Did I mention it was around 85° F the day we visited the park? Yeah, it was HOT! Thankfully, we spent a lot of time in Duke’s Lagoon! 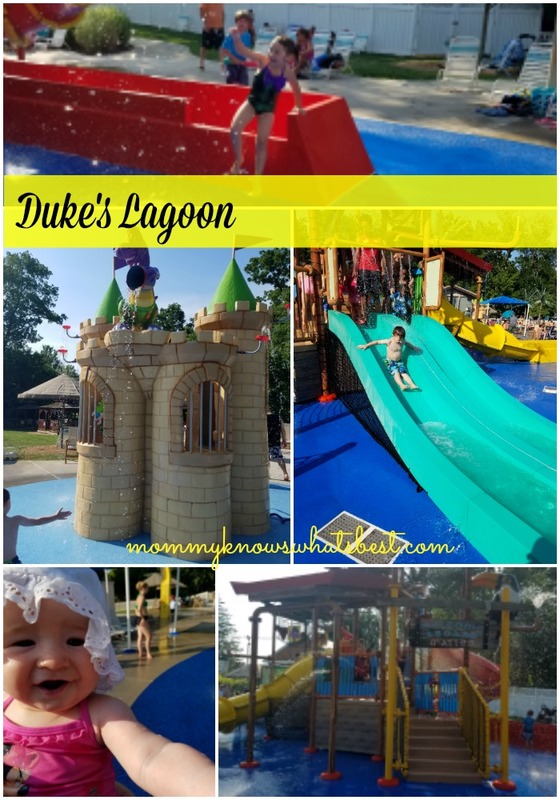 Our final destination of our fun day was Duke’s Lagoon, the water park area of Dutch Wonderland. The Pipeline Plunge slides for big kids are in this area, along with a multi-level water area, complete with geysers, sprayers, tipping cones, a giant tipping bucket, colorful sea animals, smaller water slides, and a small water castle. My kids loved this water park! There were enough small slides and geysers to keep all of the kiddos busy, plus a super-fun jungle gym area. For the parents, there are plenty of chairs and tables to sit at, many under umbrellas or palm trees. There are even cabanas to rent, if a family wanted a central area to relax. What Age is Dutch Wonderland Good For? This is a question that comes up often. 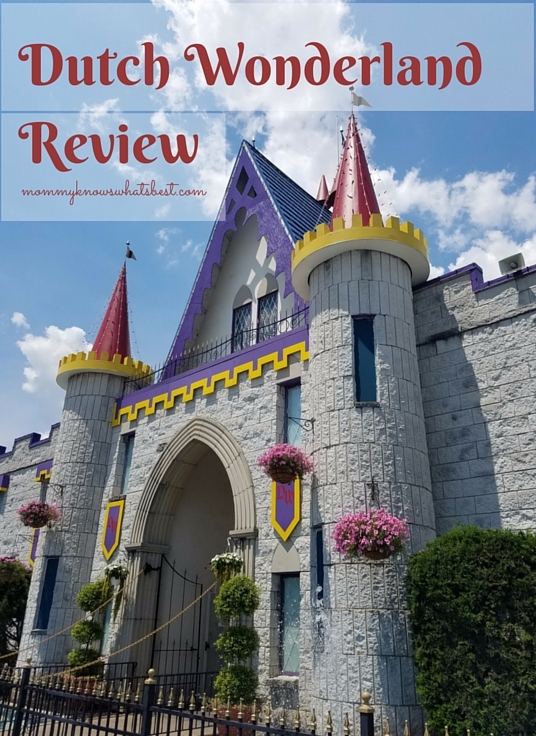 Dutch Wonderland Amusement Park is the fun destination for kids of any age, but for kids who can ride on the rides (not like my baby girl), it seems best suited for ages 2-12, in my opinion, dependent on height. 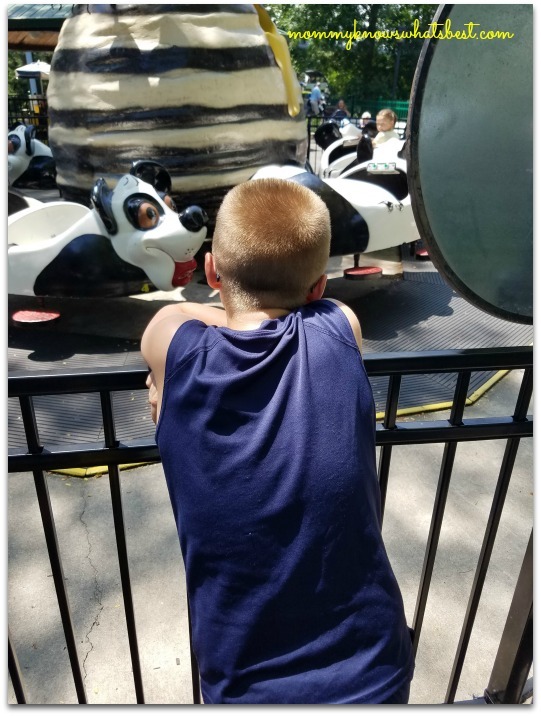 My oldest son, who’s 8 now, was a little disappointed this year because he was too tall for some of the rides his siblings were able to go on (have I mentioned how tall all of my kids are?) but he had a blast on the ones he could ride. My 5.5 year old daughter was able to ride everything this year. My 3 year old was really excited this year because he was able to go on most of the rides by himself! How Much Are Tickets for Dutch Wonderland? A very valid question! Did you know that kids 2 and under are FREE at Dutch Wonderland? For everyone else ages 3-59, for all of this awesome fun, tickets are $44.99 if you buy them online (or you can get them for a discount when you order them in advance with my blogger promo code above!) . There are also senior citizen discounts along with group rates. If you buy your tickets ahead of time, you can even visit the park the night before three hours before closing with the family to preview everything there is to see and do! There are a few things to pay extra for: pony rides (approx $6), any park food, lockers, cabanas and games. That’s it! Everything else is included! It’s a great value for the whole family! When is Dutch Wonderland Open? Dutch Wonderland Amusement Park is open late April for weekends only until the last week in May, when it’s open all week long. It is open weekends only in September until mid October. I suggest a visit during the summer so you can really experience everything (like Duke’s Lagoon!). We visited the park on a Tuesday and had a great day with no lines and plenty of space for all of the visitors to move around and have fun! Since opening on May 20, 1963, Dutch Wonderland has consistently been recognized as a premier family amusement park and has been voted one of the Top 5 Best Kid’s Park in the World by Amusement Today magazine. We invite you to plan a visit to find out why generations of families have visited us and proclaimed us to be A KINGDOM FOR KIDS™! I couldn’t agree with that statement more. My kids had a blast again! Be social with Dutch Wonderland Amusement Park on Facebook | Twitter | Instagram ! They often post deals and contests for tickets! Tell me: Would you visit the park? What are you most excited about?? Many thanks to Dutch Wonderland Amusement Park for providing my family with free tickets to enjoy the park again! We had so much fun! 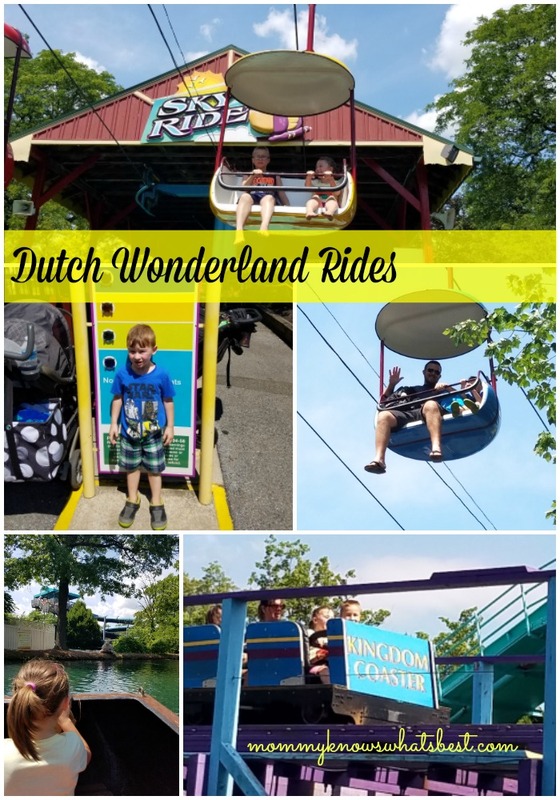 What great pictures and what a great promotion for Dutch Wonderland. It looks like so much fun for a young family.